I went into this book with a few expectations that I gained from reading the books description and its synopsis. 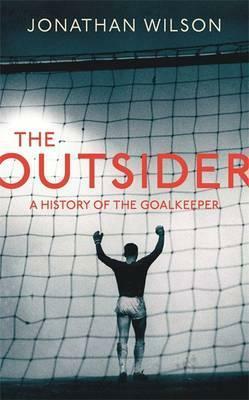 I expected it to mostly be centred around the goalkeepers character and personality. What does make him different? And how has the position changed and evolved to where it is in the modern game, which at the time sounded interesting. Now the book does this quite well in sections, the examination of the characters and their respective peculiarities does contain similarities and create an overall profile of the goalkeeper. The writing is also brilliant, having read a number of Johnathan Wilsons articles on the Guardian I knew that I was in for a well written read. The book was quite interesting in places, I really enjoyed the stories of Yashin, Folke,Felix and Grosic to name a few but I found many other stories quite drab and boring. I didn't really like the way it was presented, how it was more of a history per country (He seemingly did the UK twice, which was annoying) rather then an explanation of the greats in general. I think this is more of a personal criticism rather then one on the author, I just got sick of constantly going back to the 1920s and 50s, examining goalkeepers of little interest and really only act as filler, soon forgetting them after finishing their respective passages. Whilst I do love the beautiful game, I must admit that I do find older score lines uninteresting and therefore perhaps sports history simply is not for me. If your someone like me thats more into the personalty side of things and only slightly interested in the keepers development (perhaps id recommend wikipedia), you will find something here, however you need to work for it. I like Jonathan Wilson, and hearing he is going to be on Football Weekly or Second Captains makes me keener to listen. But with that in mind, this book is really dry, and a slog to get through.It reads as though Wilson has compiled an encyclopedia in prose form, then tried to rearrange it into vague chapters. The plus side is that less celebrated goalkeepers are featured, the negative is that it doesn't feel as though any keeper is featured in depth, and pointless anecdotes are included that often sound like myths anyway. The chapters don't necessarily appear coherent either - there is much discussion of Brazilian goalkeepers early on, then in the Penalties chapter we're given another biography of a Brazilian. The chapter on Germans starts with Peter Schmeichel.With so many characters, it is quite difficult to follow, and it is then really aggravating when Wilson puts forward his efforts for Pseuds' Corner. Among interesting stories this can be overlooked, but when featured alongside another Yugoslav goalkeeping coach you just want to sigh in exasperation.I'm sure a lot of effort went into this, but if so, that only makes the final work even more disappointing. Wilson isn't the most poetic writer normally but he is quite readable, and I'm at a loss as to how this was churned out. I'm no anti-intellectual when it comes to football, my footballing tastes can be quite pretentious, but this went beyond my limit. I really enjoyed this book, other than the parts about British soccer history. Wilson presents the goalkeeper as both an outsider from the team and as someone who has had to become more like the outfield players as the position has evolved. He highlights a few factors for why goalies are outsiders:1. Soccer was originally a fertility rite (think agricultural fertility, not human reproduction). If the ball went in the goal, then the harvest would be good. Who is stopping the objective of the game? The goalie.2. If someone wanted to fix a match, whom would they bribe? The goalie.3. Goalies tend to stand apart from the rest of the players and have different rules that apply to them. Also, they usually have a lot of time to ruminate on their individual mistakes, whereas outfield players are in the flow of the game and don't have time to obsess. As someone who tends to analyze (and over-analyze) everything and who plays goalie every Monday night, this explanation appealed to me. Wilson lists a number of famous philosophers and writers who have played the position. (Camus and Nabokov come to mind.) It's a thinker's position.Wilson does a great job of telling stories about goalies from all over the world. Some examples that stand out:1. The tension between goalies who tend to stay on their lines and goalies who are proactive in attacking situations outside of the box. Wilson offers two examples: Thomas Nkono and Joseph Antoine Bell in Cameroon and Ubaldo Fillol and Hugo Gatti in Argentina. No one has ever agreed on the right way for a keeper to play, although the position has certainly become one in which ball skills are important.2. The evolution of the sweeper keeper as a result of the Hungarians' outstanding team in the 1950s, followed by Total Football from the Dutch, Ajax, and then Barca in the 70s. In contrast, the Italians have generally preferred a more stationary keeper to go with their defensive systems.3. The cult of the keeper in the USSR as the individual who stands apart from the collective. Also, because the USSR produced the best keeper of all-time - Lev Yashin - there is a constant search for "the next Yashin," like the search for "the next Maradona" in Argentina, "the next Herschel" at UGA, or "the next Dylan" in rock music. I quite enjoyed Wilson's explanation as to why Russians struggle so much when they try to play abroad.4. The professionalization of goalkeeping in Brazil, which saw the country go from viewing the position as an embarrassment to one that that is important. Brazil never used to export goalies and now they have a number playing for big European clubs. I love Jonathan Wilson not just because i like a good book about football but because he has a point and an understanding of wider complexities of sport. This book is similar in style to inverting the pyramid as it is essentially in historical order and each chapter concentrates on a different country and its goalkeepers.What Wilson always does is couple football to the wider world, it has an element of social history as well as football knowledge, Wilson always likes to find sacred cows and make them into well burgers i suppose. If you have read him and liked him then you know what to expect, its broad and brief but is entertaining and informative and he does join up lots of dots. This is a very specific book... I'm not sure how many people would find it interesting. But if you are a really obsessed soccer fan, and especially if you are a goalkeeper, it is about as good as it could be. JonathanWilson - Jonathan Wilson is a British sports journalist and author who writes for a number of publications including the Guardian, the Independent and Sports Illustrated. He also appears on the Guardian football podcast, Football Weekly.